Puppy mush is the first solid food for most puppies. It's a gruel of dry dog food, that is easy to eat. This is fed as a supplement to the mother's milk, and gradually fed larger and more frequent meals until the puppies are weaned and no longer nurse. Put a cup or two of dry dog food into a mixing bowl or pan. The amount is determined by the number of puppies and their size. This is the first time the puppies are eating solid food, and most of them will end up wearing more than they eat, so you only need enough so they all get a taste. It's best to use the same dry food their mother has been eating, which should be a high-quality puppy food while she's nursing. Add an amount of puppy formula to cover the dry food. 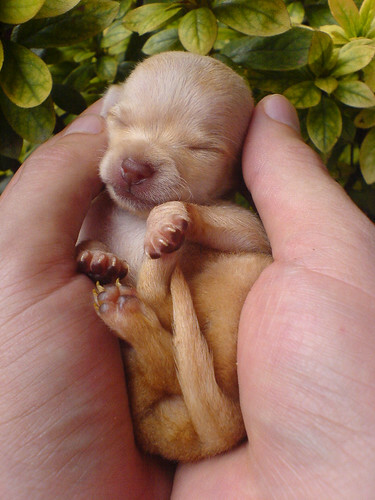 You can use plain water instead of puppy formula, but if the mother is no longer able to nurse the pups, formula is best. Cover the bowl and allow it to stand long enough to get soft, about 15 to 30 minutes, depending on the amount of food. Stir and mash the softened food until it is the consistency of a thin porridge. Add a little more water or formula if needed. As the puppies grow and learn to eat better, you can gradually thicken the mush, but keep it thin at first. You can add canned dog or puppy food at this point, but for the first meals keep the amount very small or the mush will be too thick.